Mario Balotelli was fined $10,000 following remarks he made after Inter Milan's 1-0 victory at Chievo. Serie A authorites fined the teenager $10,000 for saying that the city of Verona "disgusted him"
(CNN) -- Inter Milan striker Mario Balotelli has stood by the remarks he made following Wednesday's 1-0 Serie A victory at Chievo. The teenager scored the only goal for Jose Mourinho's champions, but reacted angrily to home fans who jeered him when he was substituted with two minutes of the match remaining. In a post-match interview Balotelli said: "Every time I come to play in Verona, the city disgusts me even more," a remark which saw him fined $10,000 by the Italian league authorities. However, on Thursday, Balotelli issued a statement on his official Web site, saying: "I will not apologize to those who insulted me. "But I do apologize to those who were innocent and whom I offended through my expressions, which were conditioned by the boos I received during the game. I am tired of always hearing racist chants when I'm on the pitch. It doesn't happen just at Verona. "I should have made it clear that the fans in Verona and around Italy who boo me disgust me. Instead of enjoying a good sports game, they prefer to insult me. "I am tired of always hearing racist chants when I'm on the pitch. It doesn't happen just at Verona. I was ashamed to hear my own Inter fans booing Chievo's Luciano. It's a disgrace which must end." 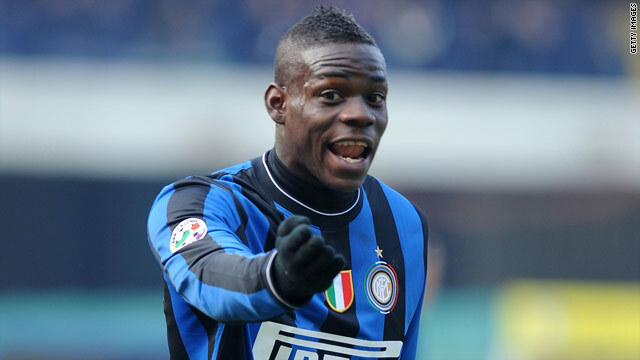 Balotelli added: "I am not angry with Verona. I like the city a lot, so much so that I went to see Juliet's house with a friend."